Vermin (originally released in North America as The Exterminator, model no. 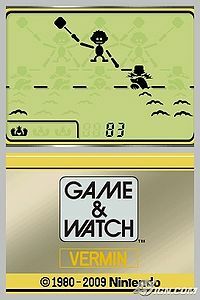 MT-03) as a game in the Game & Watch series. The unit was released as part of the Silver series in July 1980. Time to clean up the neighborhood! Move the player to the left and the right, hitting the moles that appear. Nintendo first began releasing the Game & Watch series in 1980. This collection of games was available on portable LCD devices, and each title featured a game and a clock. Each Game & Watch title features two modes of play: GAME A (normal difficulty) and GAME B (more advanced play). While some controls have been changed in the DSiWare version to better suit the Nintendo DSi system, the appearance of the game itself has not been altered. Time to clean up the neighborhood! Move the player to the left and the right, and hit the moles that pop out of holes in the ground. Moles appear from four holes in GAME A and from five holes in GAME B. The moles in GAME B move faster than those in GAME A, and they also appear more frequently. Earn one point for each mole hit, or receive a mistake icon for each missed hit. Receive three mistake icons, and it’s game over! Nintendo first began releasing the Game & Watch series in 1980. This collection of games was available on portable LCD devices, and each title featured a game and a clock. Each Game & Watch title features two modes of play: GAME A (normal difficulty) and GAME B (more advanced play). While some controls have been changed in the DSiWare version to better suit the Nintendo DSi system, the appearance of the game itself has not been altered. Game Boy Gallery Game Boy 1995 An updated version of Vermin is included in this game. NA/EU: 1998 Two versions of Vermin are available in this game: a recreation of the original and an updated version that features characters from the Super Mario series. EU: April 9, 2010 A recreation of the original Vermin, released as a digital download on the Nintendo DSi Shop. This page was last edited on 18 August 2016, at 22:09.